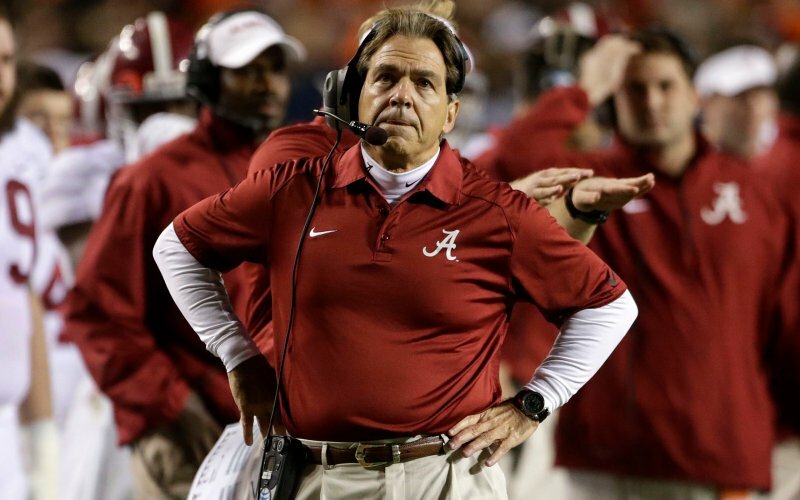 Alabama Football: Is The Crimson Tide’s Dynasty Over? Nick Saban has spent the last eight years building the Alabama football program into the most dominant program in the nation. The Crimson Tide‘s time in the sun is now over as spread offenses and simple complacency have signaled the end to Alabama‘s run. Saban took over the Alabama program in 2007, and has produced a 91-17 record during his tenure as the head coach in Tuscaloosa. 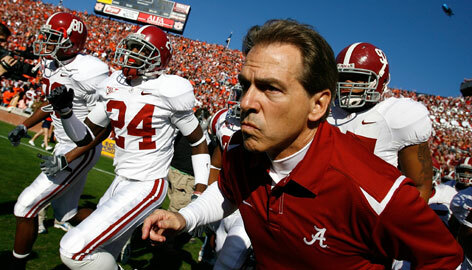 He has averaged over 11 wins per season by transforming the Crimson Tide into a college version of an NFL team. Alabama wins by shutting the opposition down with an elite defense, and pounding the ball and controlling the clock on offense. Saban‘s coaching philosophy mirrors the philosophy of old NFC East teams where a strong running game and a stout defense equaled victories. College football has changed during Saban‘s tenure, and he still has not adjusted to the times. Alabama has lost games in January for consecutive seasons for the first time under Saban. The majority of college football teams in America are now running the spread offense. This flies in the face of traditionalists like Saban who prefer to line up and physically beat teams. The issue for Saban is that spread teams have historically given his defense fits. The spread allows offenses to spread defenses out, and minimizes the advantages of opposing teams that have superior talent on the defensive line. This means that smaller programs who lack the recruiting prowess and tradition of Alabama can play with them on the field. In the past, the team with the most talent and ability on the offensive and defensive lines won the game. The spread allows teams with average talent on the offensive line to score points in bunches against teams with superior defensive talent. Alabama has lost four games during the past two seasons. All four of those opponents ran spread offenses. In those four losses, the Crimson Tide defense allowed an average of 36 points per game. In the past two seasons, that Alabama defense has allowed 16.3 points per game. Obviously Saban‘s defenses have issues dealing with spread offenses. The best way to stop the spread offense is to put consistent pressure on the opposing quarterback. If a defense can disrupt the rhythm of the quarterback, then the spread offense will stall. This has been an issue for Alabama because they have not had an elite pass-rusher on their defense for years. In 2014, Xzavier Dixon led the Tide in sacks with nine in 14 games. In 2013, A’Shawn Robinson led Alabama with 5.5 sacks in 13 games. Saban‘s defenses do not excel at putting a lot of pressure on opposing quarterbacks. Only twice during his eight years in Tuscaloosa have the Tide produced a defender who averaged more than half a sack per game: Dixon in 2014 who averaged 0.64 sacks per game, and 2011 when Courtney Upshaw averaged 0.73 sacks per game. If you cannot consistently put pressure on opposing quarterbacks, you will not be able to consistently beat spread teams. Alabama lost to Ohio State in the 2014 college football playoffs because they could not get pressure on Buckeye quarterback Cardale Jones, and he completed multiple long passes on third downs to extend drives. If you cannot shut down spread offenses, you need to be able to outscore them to win games. Saban has recruited a number of elite receivers to Alabama, including Julio Jones and Amari Cooper. Unfortunately he has not been able to develop an elite quarterback. Since Saban arrived in Tuscaloosa, the Crimson Tide have not had a quarterback who averaged 250 yards passing per game. The closest they got was in 2014 when new offensive coordinator Lane Kiffin installed elements of the hurry-up spread offense, and Blake Sims averaged 249.1 yards per game. The quarterbacks under Saban have always been expected to manage the game rather than be true playmakers. This changed a little bit under Kiffin in 2014, but the Tide enter 2015 with major questions at the position. Senior Jacob Coker is expected to start at quarterback in 2015. David Cornwell, Blake Barnett and Cooper Bateman are competing with Coker at the position. Coker was expected to beat Sims out in 2014 but was not up to the task. Alabama has recruited exceptionally well under Saban. According to 247Sports.com, Alabama has signed the best recruiting class in the nation five years in a row. They are accustomed to reloading every offseason, not rebuilding. Alabama‘s roster may be tested by the number of losses on the offensive side of the ball from the 2014 team. The Tide graduated three members of their offensive line, their starter at running back and all three of their starting wide receivers. Alabama returns two starters on an offense that has not won a bowl game in two years. They return one starter from a secondary that struggled mightily to get off the field on third down late in the 2014 season. The bottom line for Alabama is that unless Derrick Henry has a huge junior season at running back, the Tide will struggle to remain among the elite teams in college football. Saban was able to dominate college football early during his tenure in Tuscaloosa by running a superior program to everyone else in the college game. The opposition has caught up to Alabama, and the Tide‘s dynasty is over. Mike Taglienti is a Contributor at The Scoop. Follow him on Twitter at @MikeTag98. All you Bama-haters wish this was true. So you do not see a downward trend in Alabama’s play over the past two seasons? Dave’s Darts: I watched golf! Wait, There’s a LOGICAL Answer to Deflate Gate? SEC Football: What Stock Would Your Favorite Program Be? Where Have You Gone, Willie Mays? Could the Finals MVP be a Loser?